For some fans of gundam models (myself included), a series’ story and characters can make and break the appeal of its associated products. But for non-Japanese speaking fans that are unable read the novels written by Harutoshi Fukui, story and characters are non-issues, as Mobile Suit Gundam Unicorn has acquired notable attention largely by virtue of Hajime Katoki’s mechanical designs alone. 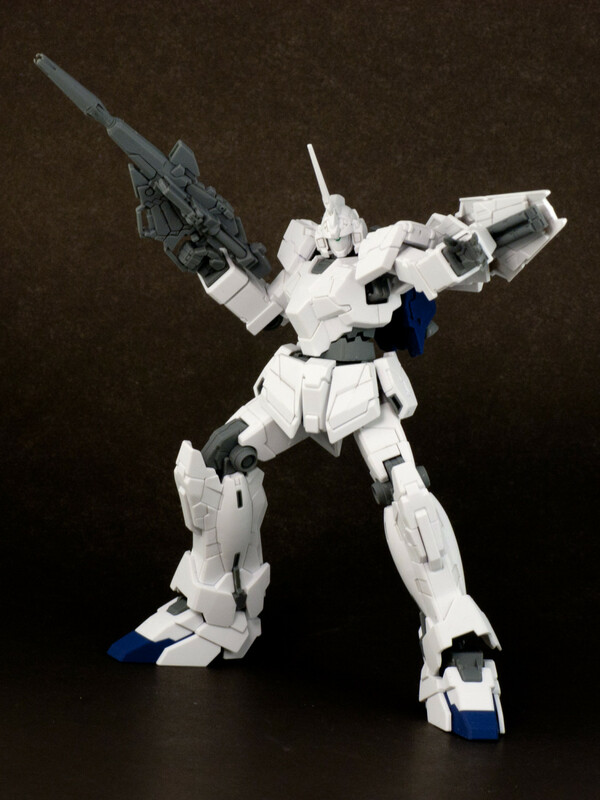 The marketers over and Bandai seem to know of this strong interest in the designs as they have launched the Gundam Unicorn line of merchandise long before the commencement of the OVA series due for release on March 12, 2010. 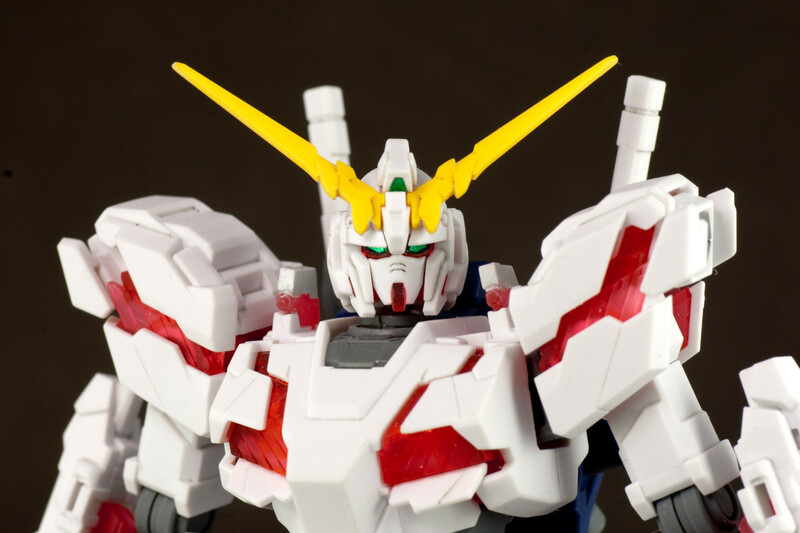 The Master Grade kit of Unicorn Gundam released one year ago attracted a lot of attention with its level of detail and its unconventional transformation gimmick. 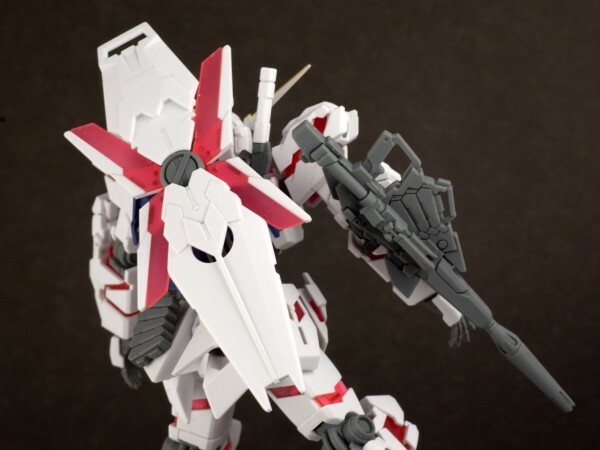 Of course, this translated to successful sales of the kit, despite its severely limited level of articulation that came as the result of the kit’s complete accommodation of the complex transformation. Since then fans have seen the release of Master Grade Sinanju, a “Titanium Coating” version of the Master Grade Unicorn, a humongous HGUC Kshatriya, the Neo Zeon grunt unit Geera Zulu, as well as separate HGUC versions of Unicorn Gundam in its unicorn mode and destroy mode – the subjects of the review. Clearly, Bandai is flooring the pedal of its promotional bandwagon, and before I knew it, I found myself crushed underneath its smooth, Katoki-designed wheels. I was hesitant towards the transformation gimmick of the MG Unicorn Gundam, due to the fear that its moving components would soon lose their holding strength after a few transformations. 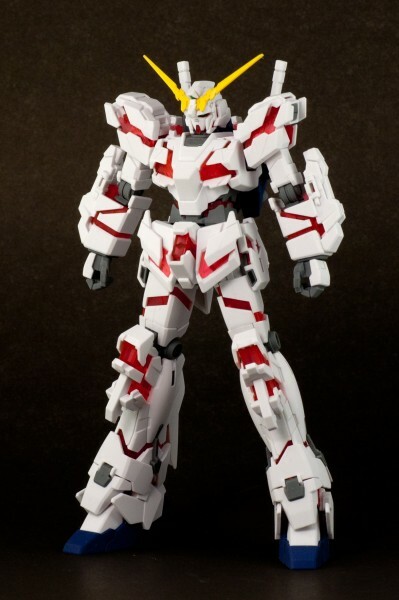 My lack of resources and steady hands also prevented me from buying the extremely impressive MG Sinanju, as I simply did not possess the means to paint the striking yellowing lining of its chest, collar, knees, shield, and sleeves. 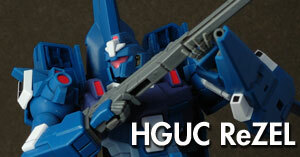 When news of the HGUC Unicorns arrived at my ears, I was pretty excited, though dubious of its execution at the same time. Can the detailed design of Unicorn Gundam really make a smooth transition to a small-scale format? What will be lost in terms of details? As I have found out after the completion of the kit, the answer is “surprisingly little”. 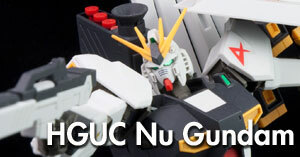 Despite their smaller sizes and prices, the HGUC Unicorn Gundams retained almost all of the aesthetic details of its Master Grade predecessor – an impressive feat, especially for the structurally nuanced destroy mode. Let’s start off with unicorn mode. 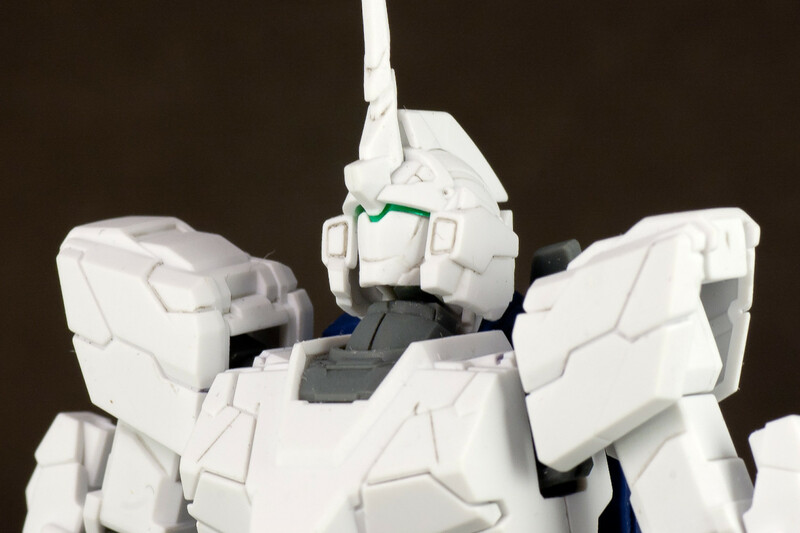 In this form, Unicorn looks more akin to a heavily customized GM than an actual gundam, as it lacks the defining v-fin, two distinguishable eyes, the mouth vents and the chin. 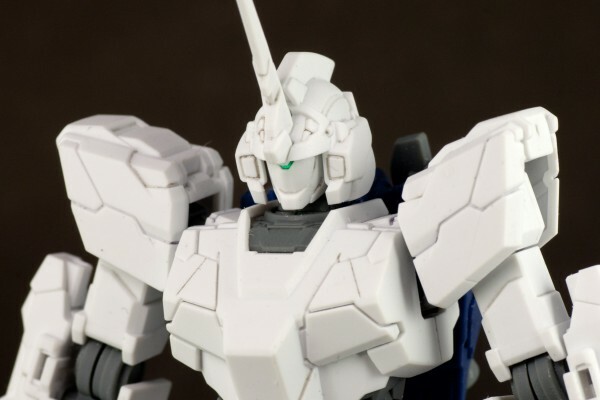 In its place, you have a visor-type eye, a GM-like face, and a single white horn protruding from its forehead in true unicorn-like fashion.The overall design has a solid, heavyweight feel to it due to its very thick set of arms and legs. Interestingly, it diverges from the parade colours adorned by most gundam-type mobile suits and opts for an predominantly white colour scheme with a splash of grey and dark blue. Not the flashiest model, it possesses its own simple and distinct charm. Destroy mode, on the other hand, is the antithesis of its pre-transformative state. Bands of bright red are scattered throughout the armour, thus completely upsetting the neutral feel. It also gains a significant amount of height from the transformation, especially in its legs. As a result, Unicorn changes from a stout and stocky build to a relatively tall and lean shape. 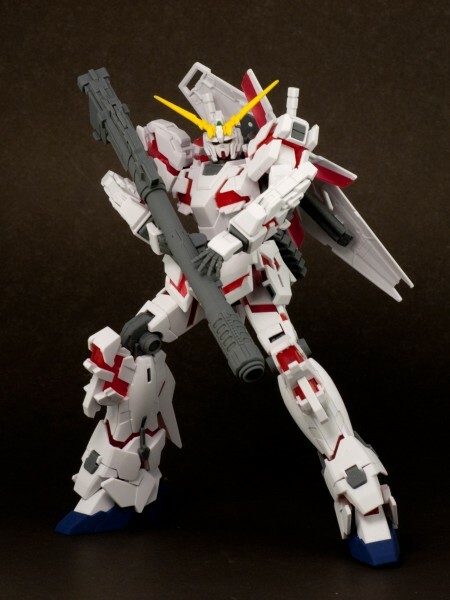 The yellow v-fin, out vents, red chin, as well as the dual eyes make their reappearances on destroy mode, and the beam saber holders on its transformed backpack are pointed upwards, suddenly infusing the GM look-alike with distinctly gundam aesthetics. 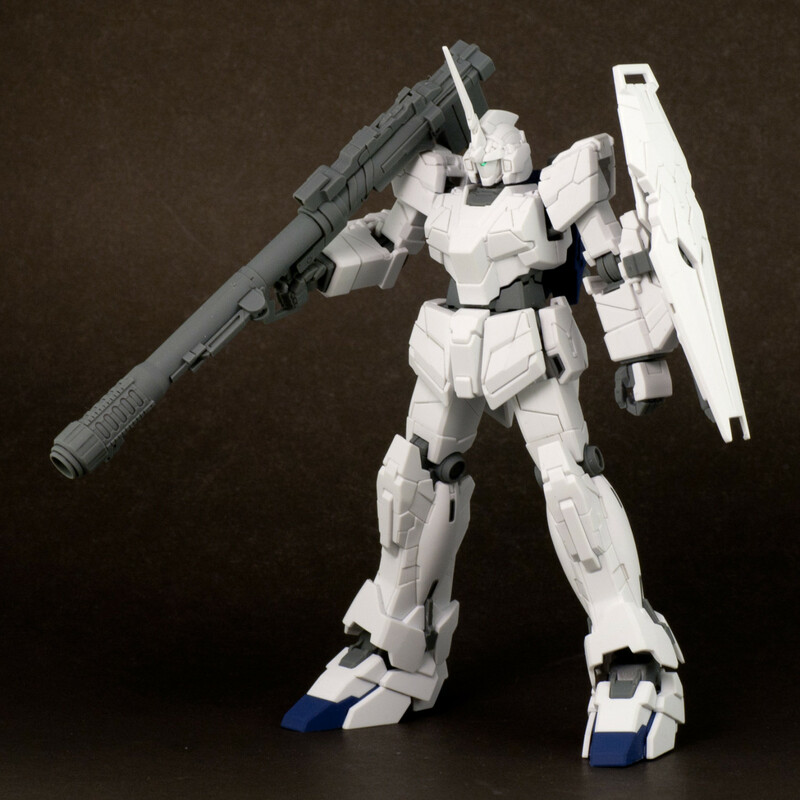 Another thing of note are the proportions of the suit, as the HGUC version features slightly wider shoulders when compared to the MG version – a welcome adjustment that brings the model closer to Katoki’s original sketches. 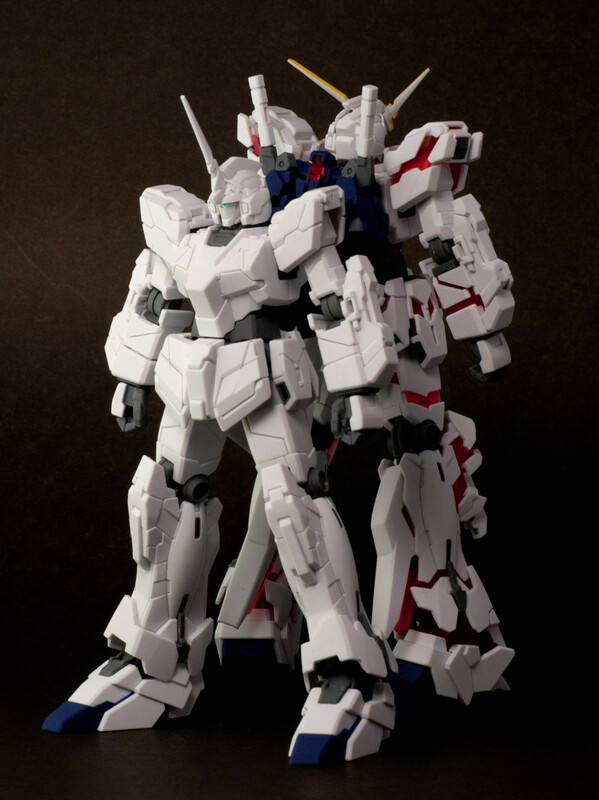 Both suits are considerably taller than regular 1/144 model kits. Destroy mode in particular dwarfs the RX-78-2 and is able to stand shoulder-to-shoulder with Nu Gundam. In other words, you are getting a LOT of gundam for your buck. Much of the praise I have in regards to these two model kits lies in the amount of effort the engineers at Bandai put into the models’ details. For a couple of HGUC kits, Bandai could have taken so many shortcuts and opted for foil stickers for the smaller details (or worse yet, ignore them altogether). 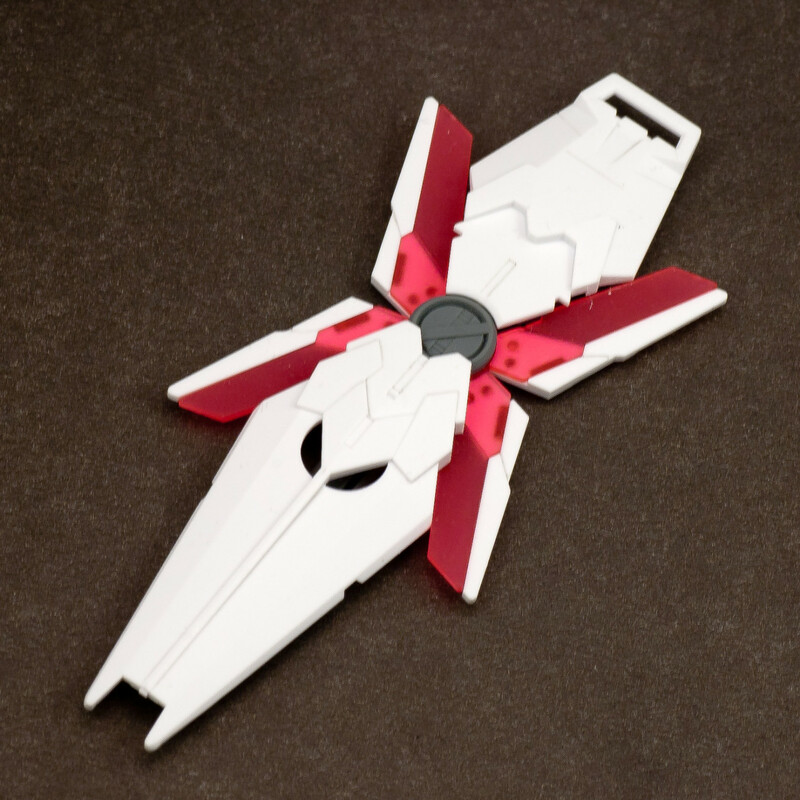 Yet despite the complex designs, the kits are almost entirely moulded in the correct colours and will look almost flawless without any paint whatsoever! Looks like Bandai has spared no efforts in order to rejuvenate interest for the UC timeline in the younger generation by making these kits as accessible to beginners as much is reasonably possible. Let’s take a look. The only foil stickers you will find for unicorn mode are for the visor and for the camera on the hyper bazooka. The remainder of the kit, save for some components on its weapons (more on this later), is completely colour accurate. 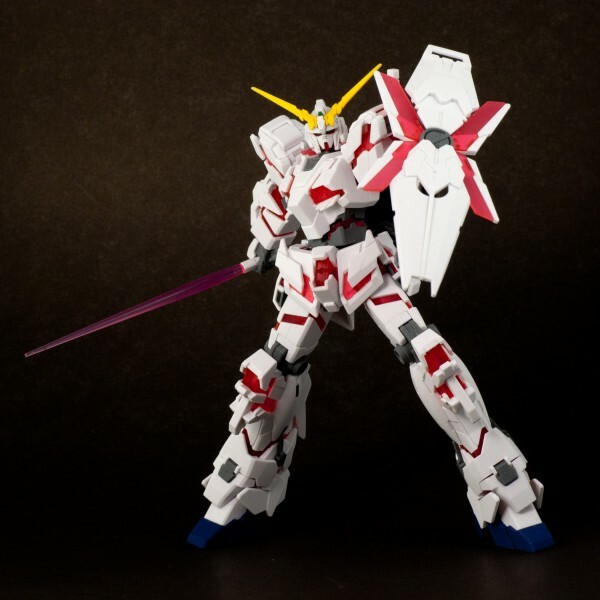 While this may not seem like such a big deal given uncomplicated nature of unicorn mode’s colour scheme, Bandai has gone out of its way to make this kit look great even after a straight snap build. By this I refer to the vernier thrusters on its legs and skirt armour. There are four small verniers on each leg and two on each of the side skirt plates. While these have been usually ignored on previous HGUC kits and left for the builder himself to add the paint needed to achieve accuracy, these twelve inconspicuous verniers were not. Together, these small details help to prevent the lower half of unicorn mode from looking flat, as well as granting the perfectionist the peace of mind and relief to their wallets. 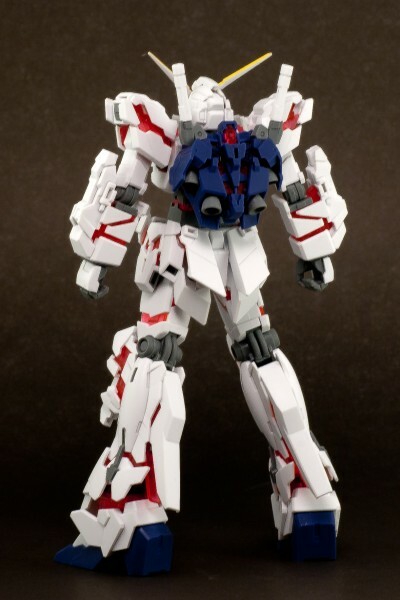 The armour on Unicorn Gundam itself is very finely moulded and is relatively easy to panel line for the most part. The exceptions to this are the shoulders. These pieces feature grooves that are slightly wider and much deeper than the others, making it hard for ink from both hard-tipped and soft-tipped markers to reach their desired destinations. I imagine this would be less of a problem for those who panel line with a wash, but to those stuck with markers, I would recommend against going after these grooves at all. The reason is this: the process of panel lining is to make grooves in the surfaces of the model more visible. However, these deep grooves in the shoulders are already very visible without any detailing. If you choose to squeeze the tip into the grooves somehow, you’ll find the end result to be excessively dark and messy. While on the topic of detailing, I would highly recommend using a grey maker for detailing this particular model over a black marker. 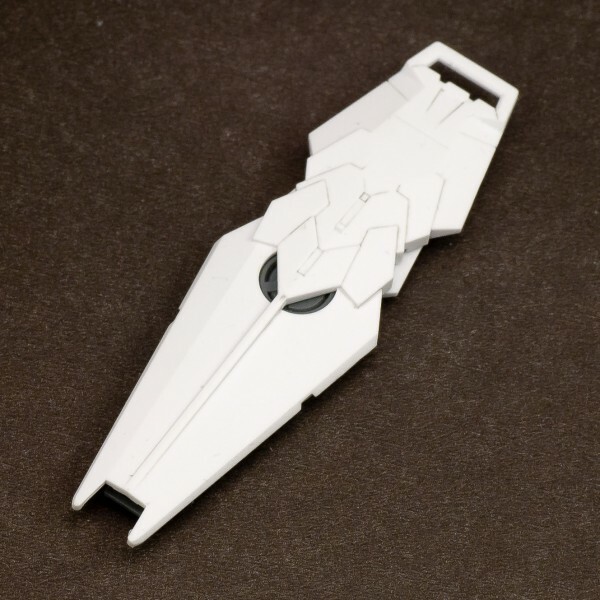 There are a lot of panel lines on this kit, and a large amount of black lines on the white surface of the model is going to have way too much contrast and end up looking very distracting. This panel line problem is a much less present issue on destroy mode, as most of the panel lines on unicorn mode mark the divisions during transformation. The psychoframe revealed in destroy mode is moulded in clear red, and it is present in all the places you would expect to find it from the original design. This is mostly accomplished by overlaying small individual white pieces over a clear red center. 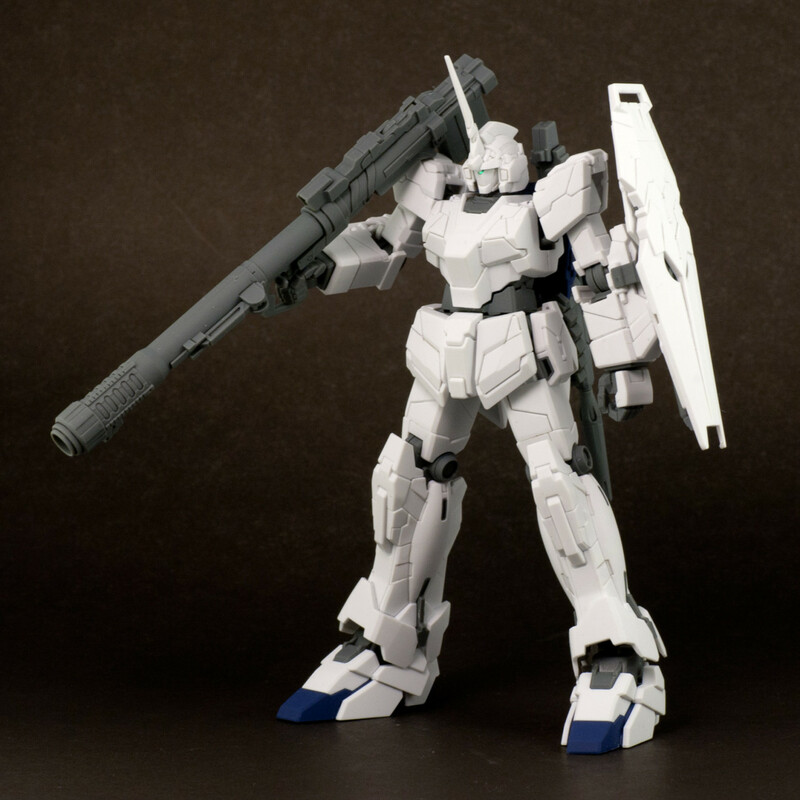 In all honestly, I can scarcely find any places where the HGUC version pales in comparison with its MG counterpart. Without the transformation gimmick, it looks like the folks at Bandai set out to create very detailed 1:144 model with zero compromise. To this end, they have achieved their goal with admirable success. 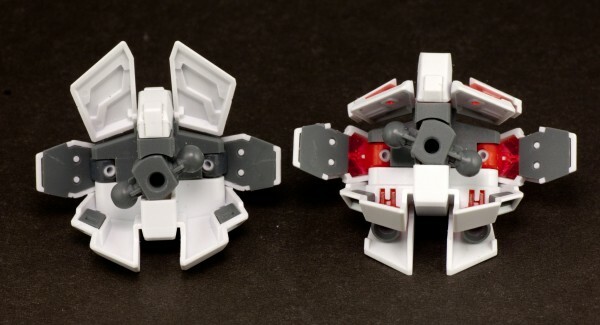 In terms of colour accuracy, the HGUC destroy mode lacks the white on the backside of its V-fin and the white on its small shoulder vulcans – all very minor omissions that one would not notice at first, second, and even third glance. The weapons also have some minor missions which will be covered later on in the accessory section, but as for the suit itself, everything other than the two aforementioned points are spot-on, including the verniers and the addition thrusters that becomes revealed in this particular form (one on each side of the backpack, two on the back of its hips, and one on each leg). You can even see bits of the red psychoframe though the small openings on the sides of its face – truly an impressive display of effort. 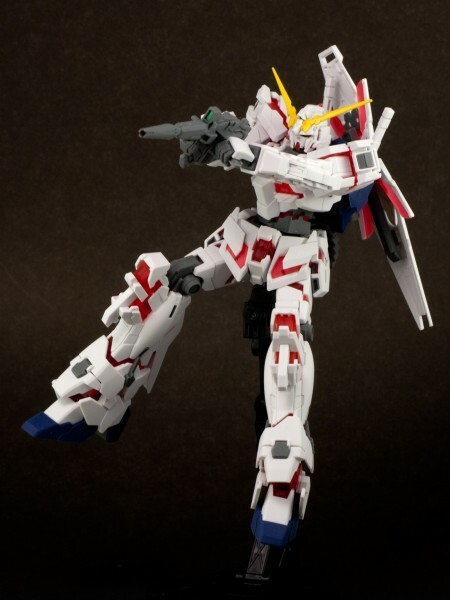 Both kits include 4 beam saber handles that are stored on its forearms and on its backpack. 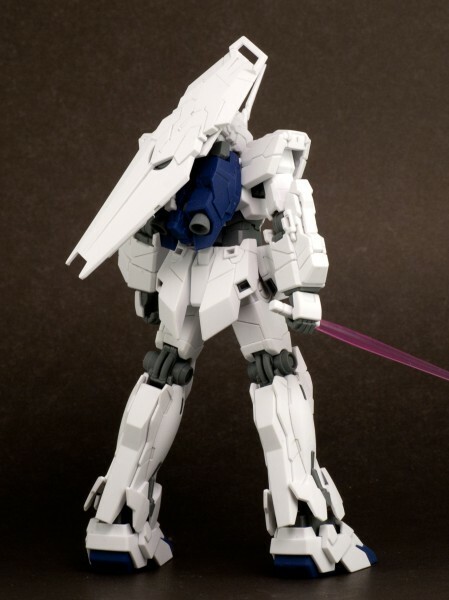 However, the beam blades for these saber are only included in the unicorn mode kit. While this may be passed off as sly marketing strategy to make consumers purchase both kits, the length of the beam saber cannot. 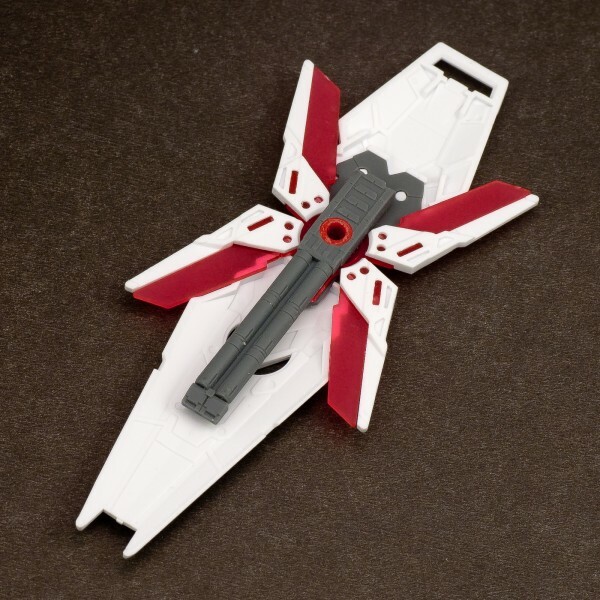 Though they are moulded in a lighter tone of pink than usual, these blades are produced with the standard beam saber mould that has been used for other kits such as the HGUC RX-78-2. 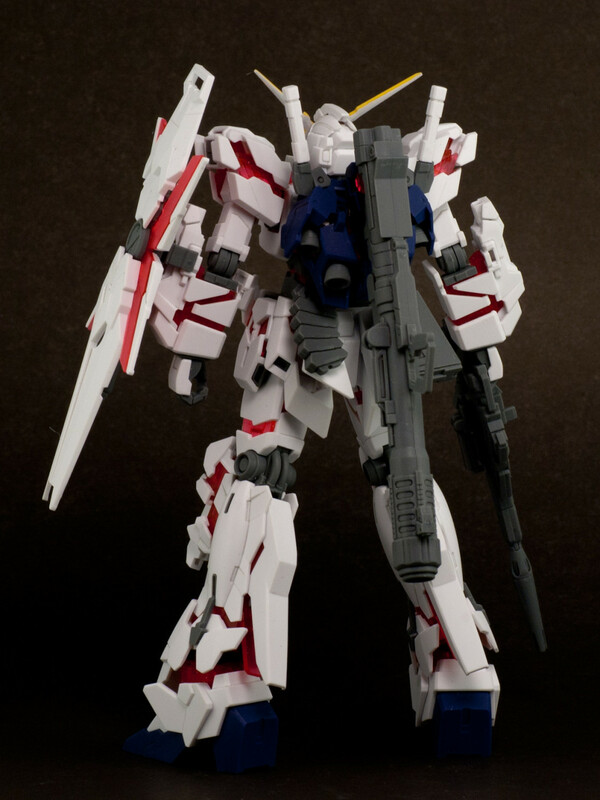 While this may not seem like such a big deal, Unicorn Gundam is significantly bigger than the likes of the original RX-78-2, especially in destroy mode. To newcomers, the blades may still seem like an acceptable length, but veterans will definitely notice the small proportions of the blades when compared with other models. 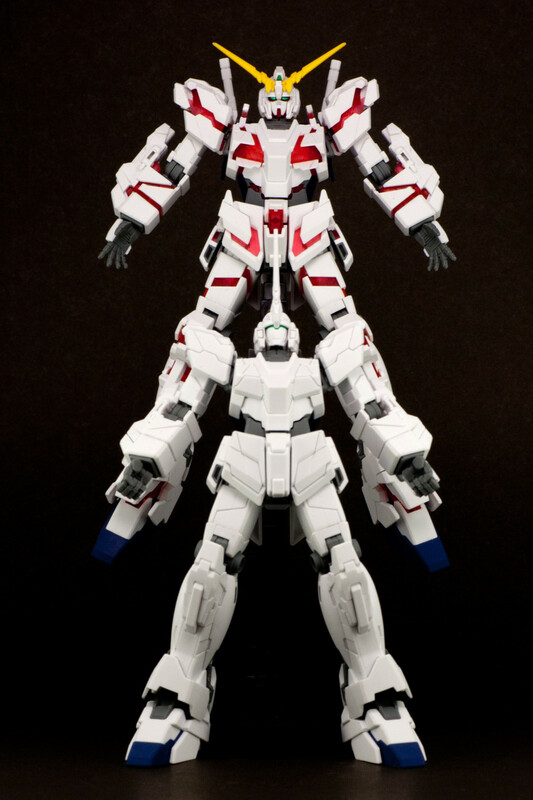 In the picture above, you will find a length comparison between Unicorn Gundam’s beam saber and that of Nu Gundam (top) and Sazabi (middle). Unicorn mode comes with a hyper bazooka and an untransformed shield. 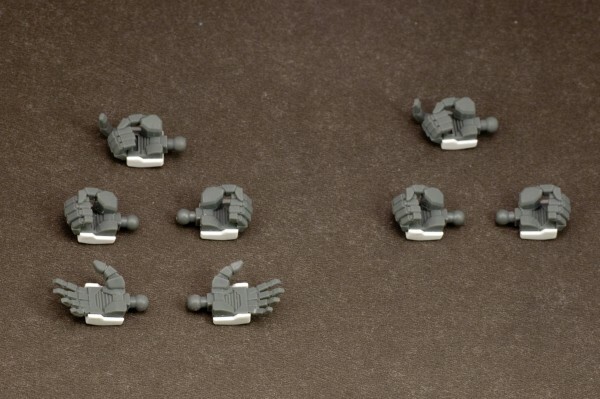 The shield can be attached to the side of the suit’s forearms via a clip, the back of the forearm using a small connector, or the center of the backpack with the same connector. The backside of the shield is not moulded in the correct colours, as the deactivated psychoframe components of the shield should be grey rather than white. This becomes a problem if you happen to be a perfectionist and want to display the model with the shield worn on the back of the forearm, in which case you would need to grab some paint to cover it up. The hyper bazooka, on the other hand, is completely colour-accurate since it’s supposed to be entirely grey. 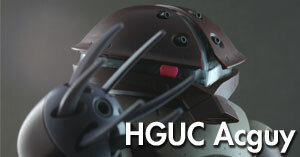 However, while the MG version is retractable, the HGUC version is not and relies on part-swapping instead. 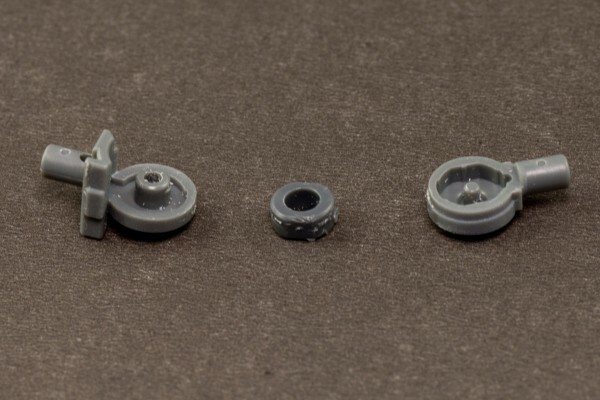 This may be disappointing to gimmick lovers, but it is also good news to those who want to coat of paint their models, as retractable paint on retractable components are very easily damaged. The sliding mechanism that attaches the magazine to the bazooka also did not survive the transition, as it is replaced by part-swapping as well. There is also fold-out handle on the side of the bazooka’s barrel and a fold-out clip meant to be attached to the backpack of either version of the suit. Destroy mode comes with the transformed version of the shield and the beam magnum. There no real problems with the shield. Though the manual reference photos show that the back side of the body of the shield should gray, I consider that as a stylistic choice rather than and standard of accuracy, thus I do not hold it against the design of the shield for this discrepancy. 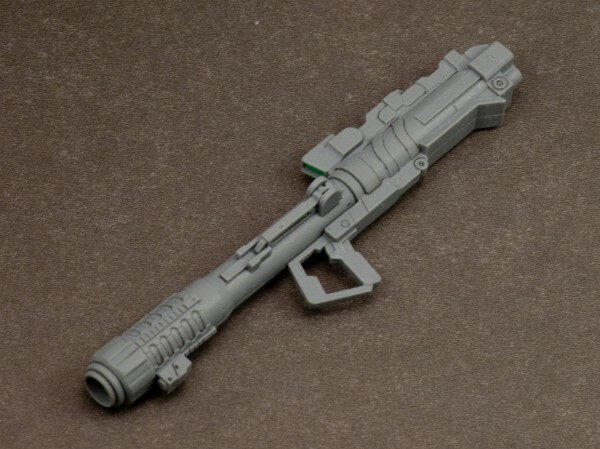 The beam magnum is similar to the hyper bazooka in its loss of the sliding mechanism used to secure the magazine. In this case, the magazine is integrated into the mould of the rifle itself, thus its dark blue colour is lost in the process. Like the bazooka, the beam magnum features a folding handle and a fold-out clip. In addition to this, another clip is moulded onto the opposite side of the handle, which is meant to be attached to the backside of the suit’s forearms. Despite than the colour inaccuracy, I must praise the design of the rifle: unlike most other standard gundam beam rifles, Unicorn Gundam’s beam magnum has a real “oomph” to it. Its long, thick barrel and heavy-looking design really make the weapon seem like it packs a punch. It’s a shame that the clip is not moulded separately in the correct colours, but the weapon remains impressive in spite of that. 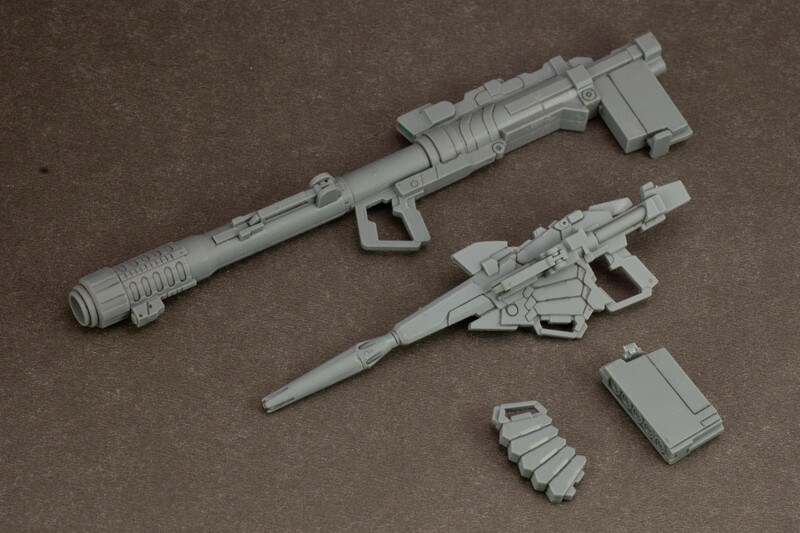 Both models come with one spare magazine for the respective weapons. 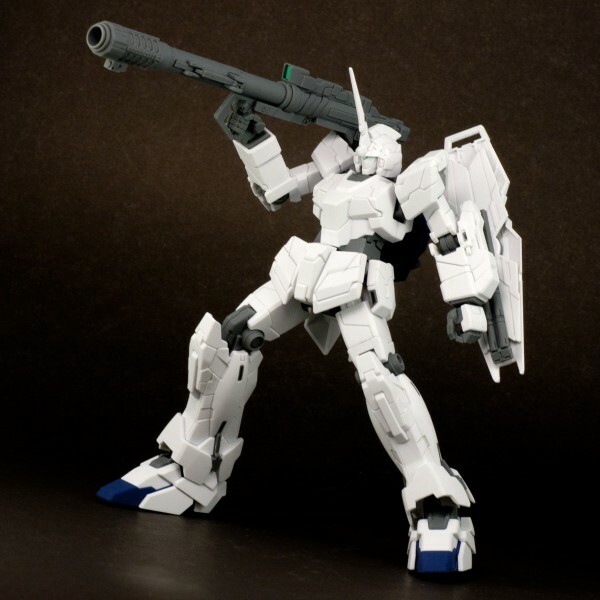 Unicorn mode’s hyper bazooka magazine can only be attached to the right side of the back skirt armour, while the beam magnum magazine can only be attached to the left. These parts fit both kits. 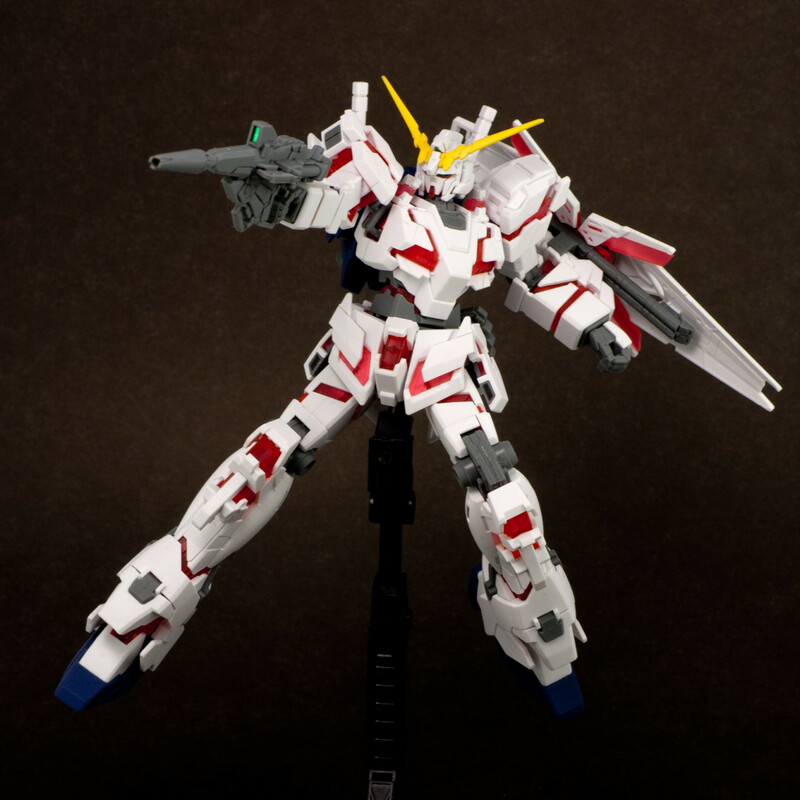 Unicorn mode also comes with a pair of open-palmed hands in addition to the standard rifle/bazooka-holding hand and hollow fist hands that can be found in both versions. 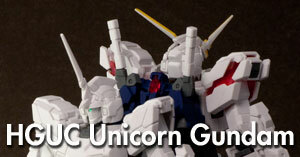 What the HGUC unicorns lack in gimmick and accessory detail, they make up in articulation. With the exception of one point, the articulation undeniably improves in these newer kits. The waist, shoulder, elbow, and ankle joints are possess the around the same level of articulation. 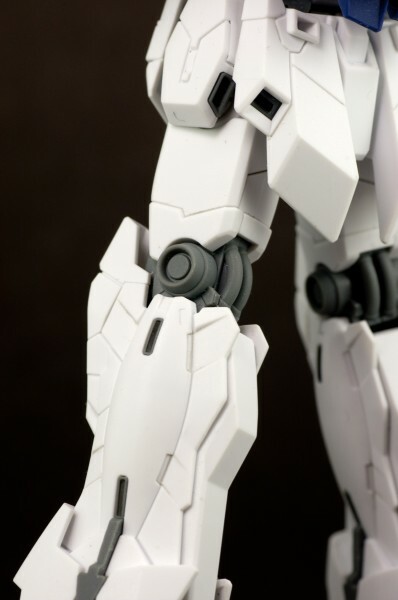 The waist and wrists is ball-jointed, the shoulders are able to swing forward by about 20 degrees, the elbows bend to around 100 degrees forward, and the ankle is double jointed with ball joint on the bottom and a single-axis joint immediately above (they are still considerably restricted by the leg armour, so the range of moment is still pretty limited – standard fare for HGUC kits). The neck joint is a major improvement. In addition to the standard ball joint, the neck is able to swing backwards, allowing for a much greater degree of movement. The hips take after the newer HGUC designs in its ability to position one leg slightly in front of the other (see photo). 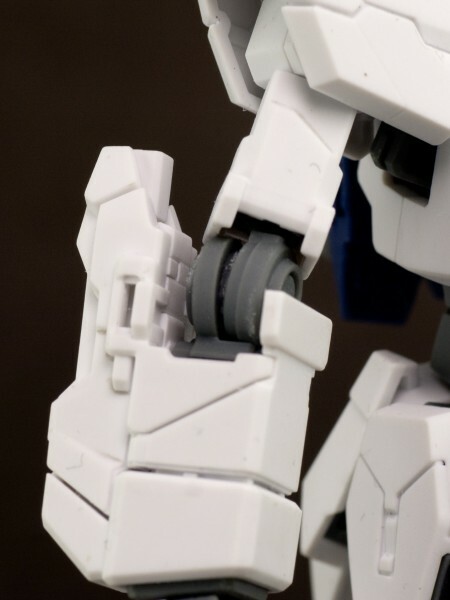 But the biggest improvement lie in the knee joints, which are able to bend backwards around 90 degrees, unlike the laughable knee articulation of the MG version. 90 Degrees isn’t going to allow Unicorn Gundam to squat, but it’s still sufficient for most posing demands. 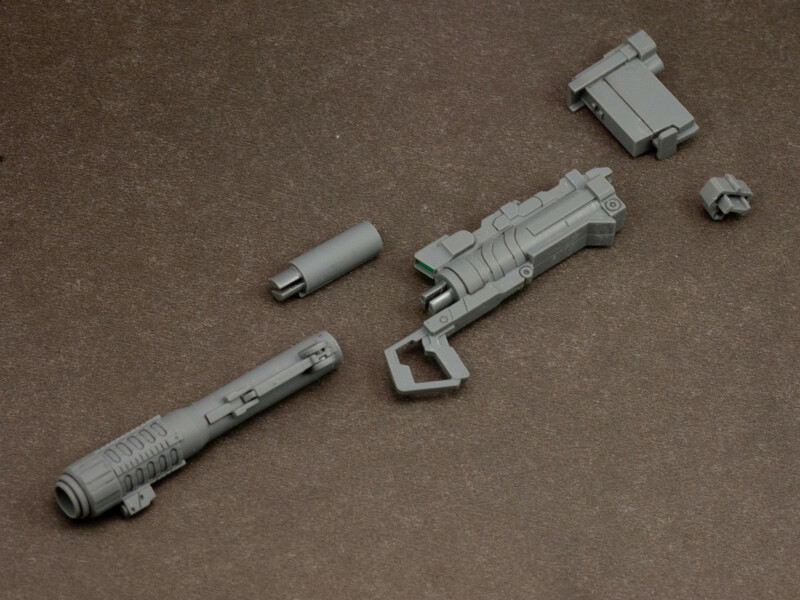 However, there is a serious drawback to the articulation of these new kits as well: the forearm beam sabers, or the “beam tonfas”. 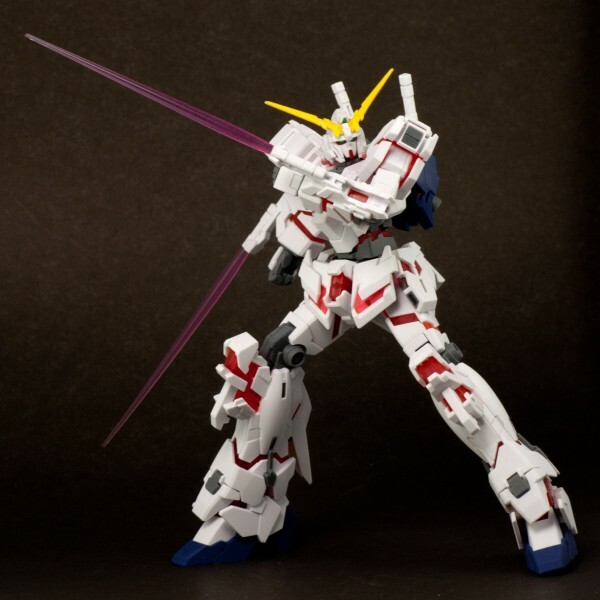 The beam saber holders are merely fitted onto the forearms, which means there are no joints that would allow them to swing out completely. To put them into the forward position, you will have to remove the piece completely and fit it back into place in the right orientation. This method is not mentioned in the instruction manual, nor does it feel very secure, since all that’s keeping the component from falling off is surface friction. From what I can tell, the beam tonfas are a major feature to the design of the suit. As such, one cannot help but to be slightly disappointed in its execution. Both kits feature a new design in the elbow joint, which includes a polycap washer in the middle. While I imagine this might increase the longevity of the joint, it is prone to splitting when you try to turn the arm by holding onto the forearm. While the wrists are of the standard ball-joint design, they actual joint is rather deep inside the arm. As a result, the wrists of both unicorn mode and destroy mode are very limited in terms of movement. This makes mounting the hyper bazooka very challenging, as the wrist simply does not allow the leeway for the wrist to tip forward. 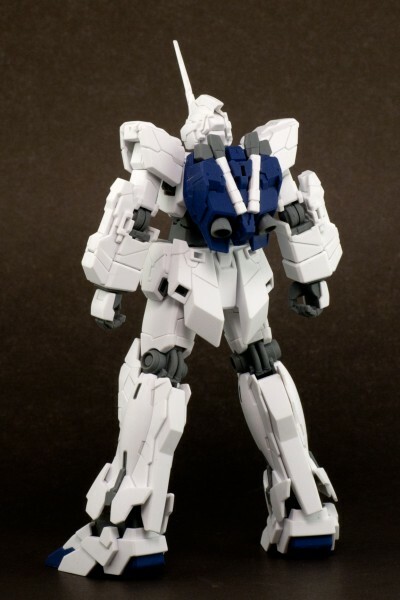 The bazooka will barely fit over the shoulder for unicorn mode, but destroy mode’s larger shoulders make it an impossible task. UPDATE (3/18/2010): It has recently come to my attention that the wrists have a little more articulation if you pull them slightly outward. Using this “trick”, the hyper bazooka can be mounted on top of destroy mode’s shoulders, but just barely. 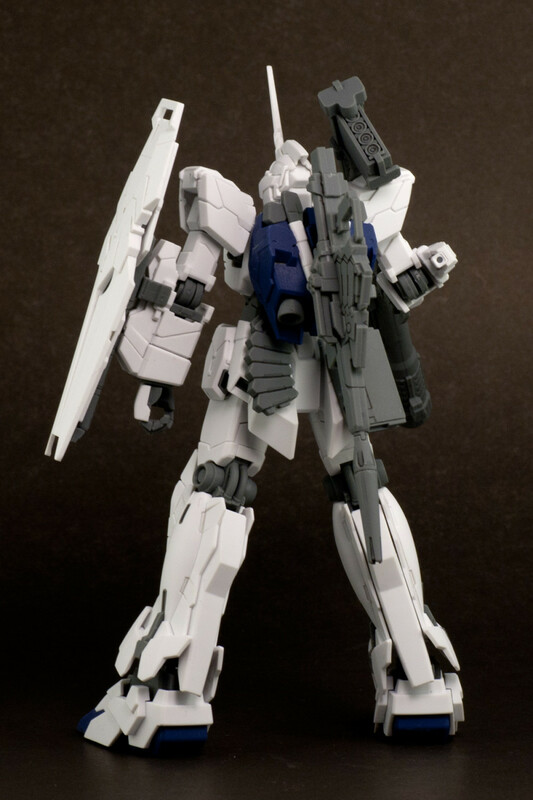 Unicorn mode retails for 1500 yen, while destroy mode retails for 1800 yen. 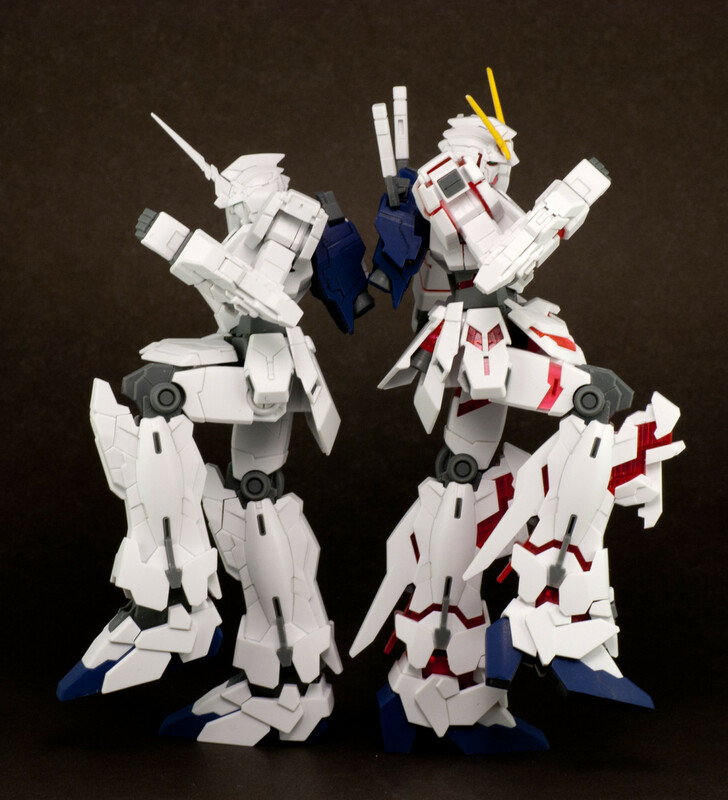 When the size and detail of these models are taken into consideration, these two kits are fabulous bargains. By comparison, the ReZEL due for release next month is priced at 2100 yen. I have little doubt that Bandai intentionally priced these kits below expectations in order to reel its customers into the entire line Gundam Unicorn of models. 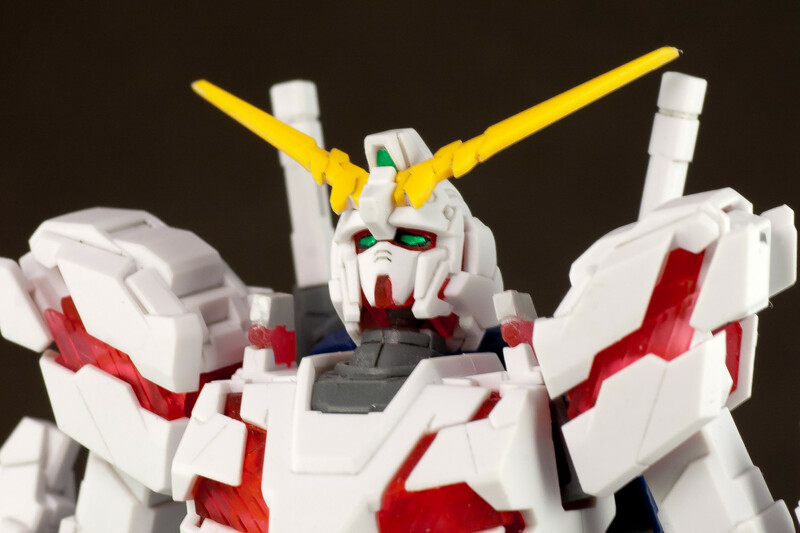 If you are someone with the will and means to paint your models, then the HGUC Unicorn Gundam (Unicorn Mode) and HGUC Unicorn Gundam (Destroy Mode) are no-brainers. Even if you aren’t big on painting you kits, the minor colour inaccuracies are not likely to bother anyone but the die-hard perfectionist, especially given the great engineering of both kits. 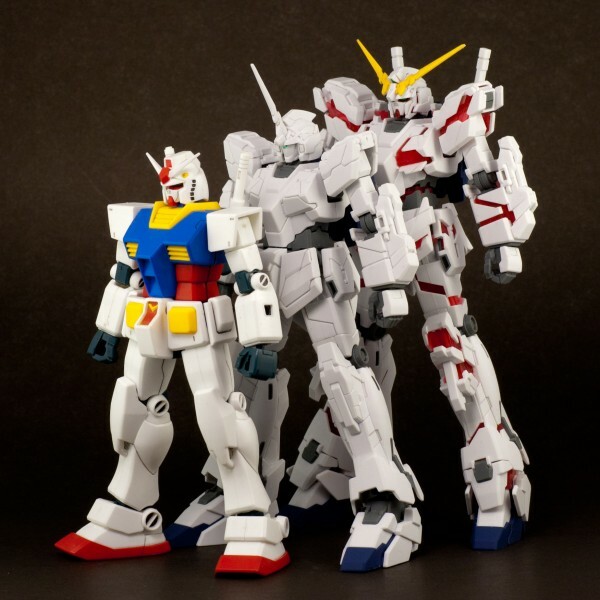 If the Gundam Unicorn OVA will anywhere as good as these models, then we are in for a glorious new chapter in the UC timeline when March swings around. 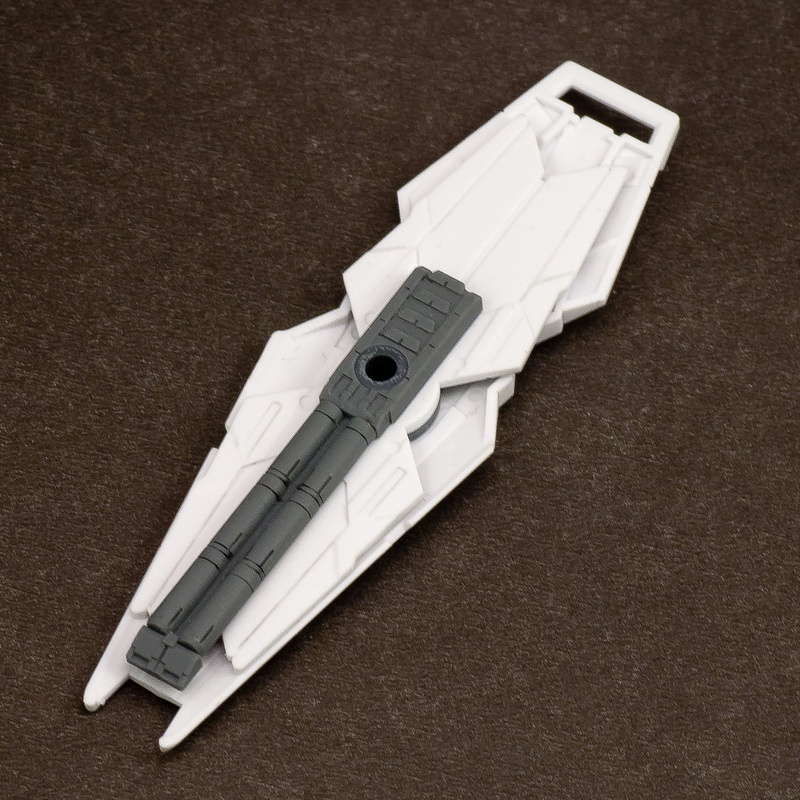 Hey Chag I dunno if you check older posts but I’m getting quite a headache choosing what and how to panel line…did you just use a regular grey Gundam marker lining pen? And which parts did you actually panel line? That is a good question, and the answer varies. My only rule of thumb is to detail any panel lines that are moulded into the piece itself. Everything else is situational. Because I use the 0.02mm Copic modeler warm gray (which makes very thin and subtle lines), I can use it pretty liberally. If I think a crevice out to have some shading, I’ll line it. However, if you are using a thicker and/or darker marker like the “official” gundam makers, then you will have to be very selective. Too many glaring panel lines may give the model a fake and messy appearance. Trust in your own judgement, but if you ask me, I’d rather under-panel line rather than go overboard. As for these models, I just lined the parts on the pieces that I think should be a division, in addition to the panel lines that are already moulded into the pieces. I just asked myself this: if this was a life-sized robot, would this part mark the division between two separate pieces? If the answers was “yes”, then I went ahead and gave it panel lines. Yep I think that was a great answer! I’m working on the same two HGUC Unicorns. 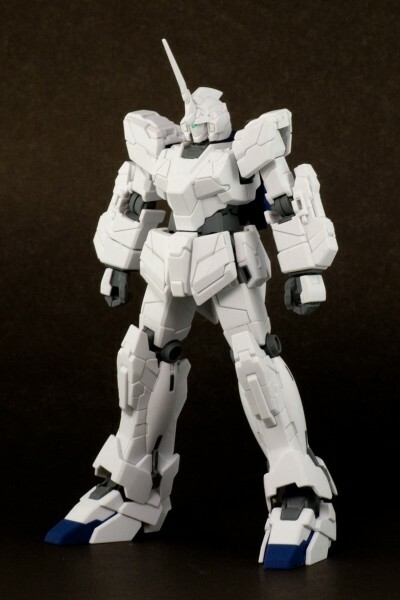 At first I went straight Gundam marker grey and the results were pretty bad to say the least. The lines are too thick and inconsistent. I’ve been trying to thin and clean them with toothpicks and cotton swabs but it’s very tedious. I heard about these Copic markers being good. Did you have to buy them online? I bought my Copics from Rainbow Ten a long time ago. I’ve seen them being sold at other common online retailers like HLJ as well. I’d highly recommend getting both the warm gray and black version. If you do get them, keep in mind to be slightly gentle with the tips, as they are very, very thin. Also, don’t forget to always put the cap back onto the markers when you are done, because they will dry up beyond repair if you leave them for too long. 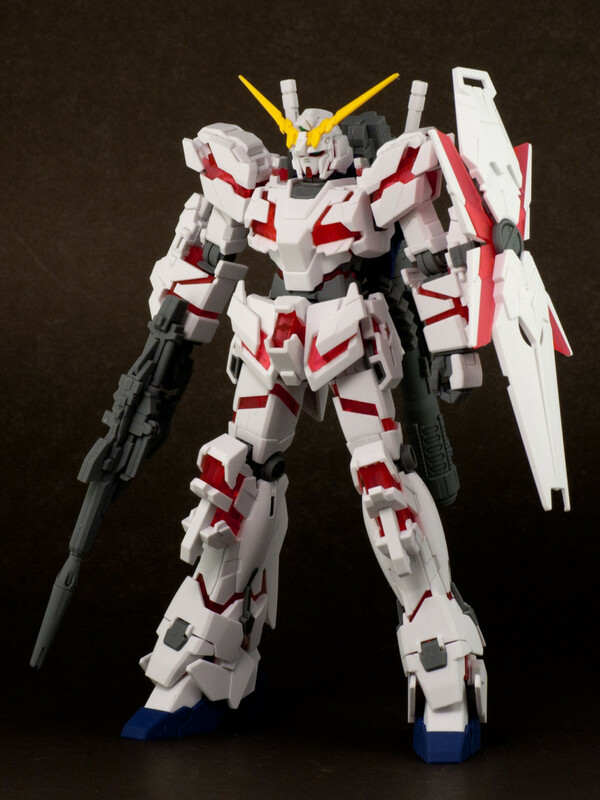 Hi chag, how did you top coat the unicorn destroy mode? 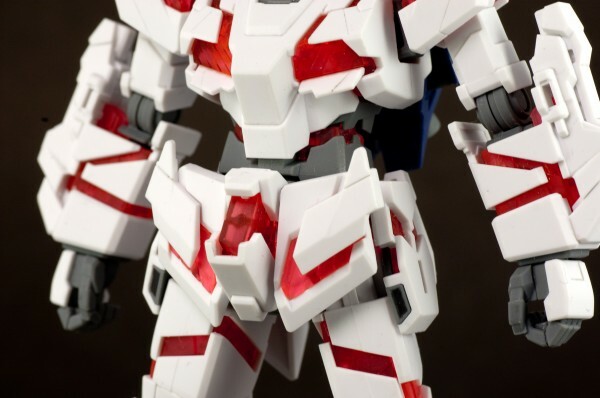 specifically, how did you top coat it without fogging up the clear red plastic? Hi Mark; to be honest, I didn’t take any measures to avoid fogging on the clear red parts. In retrospect, I really should’ve. ^^; I don’t see any elegant way to do this other than taking the model apart and separating the clear parts from the rest. I would just lay the non-clear parts face-up on a flat surface and go nuts with the top coat, then touch up any missed surfaces after they’re dry. It’s extra work, but I think leaving the psychoframe un-fogged would make the model look more striking as a whole. Ok, thanks for the comments! I guess I would have to use the HG models for poses while I use the Master Grade one for transformations. Oh, oh, oh, I want to add the LEDs inside!